This session is along the lines of the Blend Meditation mixes in that the music was specifically chosen to create an atmosphere that motivates the listener. This time itâ€™s a tribute to the Great Depression era bestselling book â€œThink and Grow Richâ€ by Napoleon Hill. Blended in between classic breaks, atmospheric pulses and world premieres are brief descriptions of the principles of the text, taken from an LP of the same title narrated by Earl Nightingale (circa 1956). Shouts to the artists featured! Sit back and enjoy! – Heavy Migration (2nd run/ 300 worldwide) is available Now at www.samplist.com/content.html. Donâ€™t miss out. This entry was posted on Friday, January 29th, 2010 at 11:14 am. 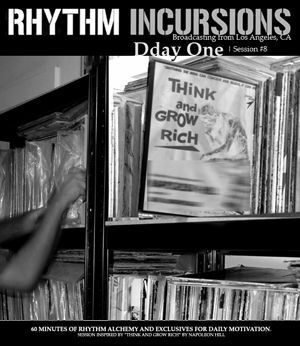 It is filed under Podcasts, DDay One - In Session series and tagged with Dday One, Om Unit, Dextah, Robot Koch, Lyrics Born, The Q4, Joe Kickass, Dark Party, Sade, Blackalicious, Bonobo, Mile Slott, RJD2, Riow Arai. You can follow any responses to this entry through the RSS 2.0 feed.